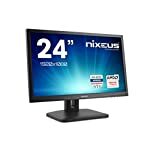 The ViewSonic VX2457 is part of the VX line of gaming monitors and is a very tempting proposition for gamers not looking to spend a fortune on their next monitor. There are a few models filtering on to the market offering faster refresh rates and adaptive sync tech but this has got to be one of the cheapest to date. The marketing blurb boasts a flicker free TN panel and a blue light filter. 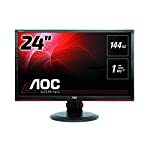 This really redefines what you can expect from a low cost gaming monitor. It’s not perfect, it won’t compete with modern screens three or four times the cost, but the inclusion of FreeSync and a 75hz refresh rate makes the ViewSonic worthy of a close look. My first gaming monitor was made my ViewSonic and I have to say I really liked it, it was a long time ago but it did give a 75hz refresh rate which was fairly unusual in the early days of flat screens. I always stood by the difference those extra frames gave me and the advantage I had in gaming from that. It’s not the 144hz that serious gamers crave but it still has an impact in my humble opinion. Unfortunately the value price target of the ViewSonic VX2457 does bear out in its appearance. It has a fairly basic glossy plastic type feel that a splash of silver can’t really improve. The stand is just a great big glossy circle and it won’t win any design prizes. But then this is not a premium monitor so let’s get our expectations into line. A further let down is the lack of adjustments available to the end user. You can’t change the height nor move it from side to side. All you get is a vertical tilt option. This doesn’t have to be a deal breaker but TN panels do need to be position carefully in front of your line of view as this has a real impact on image quality. My current monitor is stacked on a pile of books to counter this problem! If you are cutting costs, then you may well be prepared to live with this. Otherwise, fingers crossed the natural monitor height will fall right for your own requirements. Connectivity is handled by VGA, HDMI and DisplayPort. Just one of each though but that should be enough to handle a variety of setups. You can comfortably accommodate a PC and console. Headphones and internal speakers are also catered for, but don’t go expecting top quality sound in a low end monitor. Better than nothing though and handy for watching a DVD or playing console games. The out of the box image quality is nothing to get excited about according to the professional testers. The default picture settings are too bright and the text looks fuzzy but fortunately you can calibrate the screen yourself or seek out recommended configuration online that will give you a better picture. TN panels are best avoided for professional work but with some work you can get an improved image out of this model. But what about gaming? First off, the monitor is touted as having a low lag mode which reportedly delivers excellent results. Measurements show it’s latency is comparable with gaming monitors at much higher price points so you’ll find this screen to be responsive during fast action games. Another massive bonus for this monitor is inclusion of AMD’s FreeSync technology. With a compatible card this will give you smooth stutter and tear free gaming during moments of high action. Typically budget monitors won’t include adaptive sync technology so this is a big win for the ViewSonic. Unlike Nvidia’s G-Sync this system only works within a specific range. In this case it will kick in between 48hz-75hz. If your graphics card drops below 48 frames per second you lose the benefit. We give the ViewSonic VX2457 a 4.5 out of 5 rating. Want to know what existing owners of the monitor think? You can read real user reviews here. 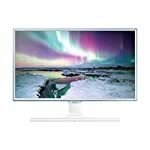 Should I buy the ViewSonic VX2457? The VX2457 looks like a very attractive choice for gamers on a budget. If you have a modern AMD card then you'll get to use FreeSync and add in a 75hz refresh rate and you start to have a screen that will give you a decent gaming experience. Of course it's not perfect, the image quality won't be good enough for professional users but casual home game players will be right at home. If you are having some doubts about this purchase then why not read some real owner reviews and see what other buyers think. Amazon.com: Are you shopping from the US? Search locally. Welcome to the ViewSonic VX2457 FAQ. This section attempts to answer common questions you may have, please get in touch if you have any more queries or if you think our answers need updating. I have an Nvidia card, can I use one of these? 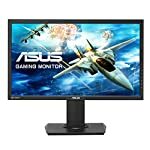 Yes, you can use the monitor, but you won’t be able to run FreeSync with it. Does it have a glossy screen? No, it’s a matt finish. We've just launched our FaceBook page, please come and like us! Note: Whilst we attempt to include up to date information in all our articles we cannot guarantee accuracy. Please check with your supplier before making any purchases. In most cases we do not have access to products and these are not hands on reviews. 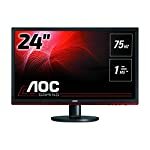 What size monitor should I buy?